Tuesday | August 14, 2018	It’s official. Chef Evelyn was nominated and awarded with the ‘Best Mentor’ plaque in 2018 by At-sunrice global chef academy. At the academy, the fulfilment stint offers six months to one year apprenticeship programme. Bakerzin is one of the companies that supports and pledges this programme. Through supporting this programme, an average of 20 students are tasked to intern in Bakerzin premises, from the mousse department to the sponge department, where everyone is scheduled to work in relation to their affiliated course module. These students will then return back to their course of study once their stint has ended where they will feedback and grade their fulfilling 6 months to a year on the job internship at Bakerzin. Through Chef Evelyn’s conscientious and patient tutelage to all her students, she was caught unaware of the nomination and more so, to her surprise the award of ‘Best Mentor’. 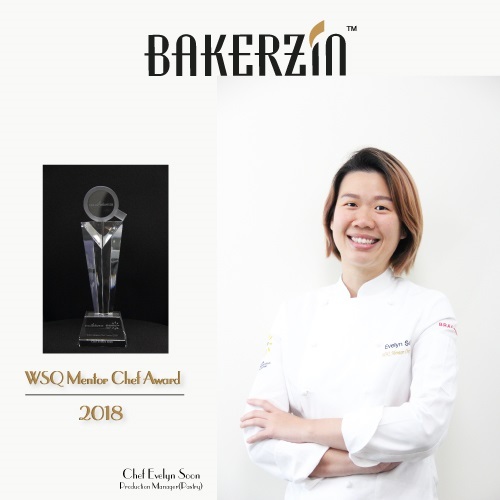 This award has given her more confidence to continue the path of excellence to guide, to teach and master greatness in the Food & Beverage industry, specifically in the pastry department. I am glad that these apprentice truly enjoyed the working experience in Bakerzin’s Central Kitchen and the takeaway of the valuable lessons they can apply in their future course of work – Chef Evelyn Soon For more information about Bakerzin’s internship and career opportunities, visit https://www.bakerzin.com/careers/ or write in to hradmin@bakerzin.com for more enquiry details.